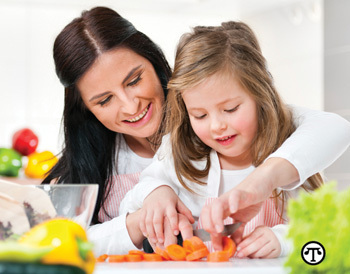 When kids participate in meal preparations, they may develop a greater appreciation of wholesome, healthful foods. (NAPSI)—Here’s food for thought for parents looking to make nutritious foods and snacks more appealing to picky eaters, while saving valuable time in the kitchen. Nutrition expert Chobani Health Communications Manager Kara Lydon, RD, LDN, shares three easy steps for introducing nutritious new foods and getting kids excited about what they eat each day. Tip 1: Share the shopping. Empower kids—and minimize morning mayhem—by working together as a family to create a weekly menu planner that starts with a trip to the grocery store. Encourage kids to help pick out any fruits and veggies they like, and then help plan dinners that feature those ingredients. Family menu planning not only makes life easier for parents, it teaches kids the value of planning ahead and making thoughtful choices. Tip 2: Give kids a choice. Letting kids choose from an array of foods is a great way to pique interest and start building a foundation for healthy habits. Try a “pick and pack” approach that lets kids have the authority to customize breakfasts, lunches and snacks to their liking—while you control all the ingredients. For a weekend lunch, for instance, offer a range of breads with whole grains and a variety of foods that can be part of a nutritious sandwich, as well as presliced fruits and bite-size veggies. For an afternoon snack, include a variety of protein options to help fuel them, such as our authentic strained Chobani Champions Greek Yogurt Tubes for kids, made with only natural ingredients and real fruit, with 5 grams of protein per serving. Tip 3: Celebrate the “try.” Encourage kids to try one new food per week. Whether or not they like the first bite, training kids to be open to a wide variety of flavors and textures can help encourage healthy habits. The opportunity to try new foods has never been greater, with many grocery stores offering easy access to exotic fruits and vegetables. As an example, dragon fruits are from the cactus family and have an exotic, spiky look but taste like a refreshing blend of kiwi, pear, watermelon and mango with a tropical twist. Kids can enjoy the familiar flavor while getting the thrill of trying something new. They may like it freshly sliced or in Chobani Champions Flyin’ Dragon Fruit Greek Yogurt Tubes. For recipe ideas and other tips, visit www.chobanichampions.com.